One of the ideas about aliens concerns the possibility that the Earth has been visited by ancient astronauts. Now, as with any other non-mainstream idea, it has been dismissed by science and the scientific community. But that does not mean it is irrelevant or wrong. Indeed, the concept of ancient astronauts was given a huge boost in the 1960's by Carl Sagan. In his book, "Intelligent Life in the Universe", he suggested that historical extra-terrestrial contact should be given serious consideration. That led to people like Erich von Daniken and Zechariah Sitchen to gain popularity with their examination of evidence around the world about alien intervention in histric and pre-historic times. Popularity, however, does not convince scientists...unfortunately! Nevertheless, despite the fact that we have no absolute proof, in terms of actual burials, bodies or other artefacts, there is compelling evidence that we have been visited by ancient astronauts. For example, some of the most ancient sites have been constructed with huge blocks of stone which are even now beyond our skill in handling. Places like the Great Pyramid or Baalbek remain as puzzles for modern engineers. While their presence doesn't automatically mean that they were built by aliens, it does force us to look at other possibilities. The most persuasive of the evidence available is found in the cylinder seals of Sumeria and in some of the hieroglyphics in Egypt. 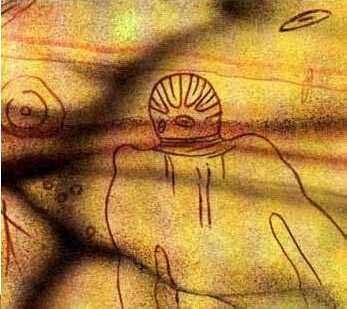 In both cases, there are depictions of strange craft or other strange beings which are completely out of place otherwise. The first picture, on the left, is of a painting found in the Sahara. There are other similar depictions of beings in Italy, for example. The image below is taken from Egypt and shows several strange craft. The ancient Indian texts speak of flying machines called vimanas which moved at great speed above the ground. There are stories around the world speaking of highly gifted individuals who came to various cultures and helped them progress. From the Kokopelli North American Indian legends to Viracocha in South America, the story is the same. To dismiss the possibility of ancient astronauts outright is simply to not want to look at what might be. It is plain that modern science does not have the answers for a complete and unarguable version of the history of mankind. There are gaps and there are tantalizing glimpses of a vast history behind what we already think we know. Even the age-range of civilization currently accepted is probably wildly wrong. Such finds as a shoe sole (with visible sewing) petrified in rocks dated to 213-248 million years ago, or a gold chain embedded in coal dated to 260-320 million years ago should give us pause to think that perhaps aliens visiting earth are also just as possible as these other evidences. And if that's not enough, then consider that obviously inteliigently crafted grooved spheres have been found in the 1980's which date back 2.8 billion years. I think that the whole idea of ancient astronauts is entirely plausible, given how little we know of our own history!